The present study aimed to determine the concentrations of several disinfection byproducts (DBPs), including trihalomethanes (THMs), haloacetic acids (HAAs), and haloacetonitriles (HANs), in the public and private swimming pools in Sanandaj, Iran (n=16). Correlations between DBP levels with water quality parameters (free chlorine, pH, total organic carbon, temperature, number of swimmers, and gender of swimmers) and various DBP categories were investigated and compared. According to the results, concentrations of THMs in public and private pools were lower than the recommended limit in Iran (200 µg/L). In addition, HAAs had the highest concentrations, followed by THMs and HANs, respectively. Among the HAAs, THMs, and HANs, trichloroacetic acid was the most dominant species, followed by chloroform and dichloroacetonitrile, respectively. DBP levels were not affected by the gender of swimmers, number of swimmers, pH, temperature, and free chlorine. However, total organic carbon showed a fairly good correlation with TTHM, THAA, and DBP levels (r=0.45-0.78; P<0.05). Some correlations were also observed between various DBP categories. 1. Simard S, Tardif R, Rodriguez MJ. Variability of chlorination by-product occurrence in water of indoor and outdoor swimming pools. Water Res 2013;47(5):1763-72. 2. Lee J, Ha K-T, Zoh K-D. Characteristics of trihalomethane (THM) production and associated health risk assessment in swimming pool waters treated with different disinfection methods. Sci Total Environ 2009;407(6):1990-7. 3. Heydari M, Parsa N, Davani R. Potentially Hazardous Trihalomethanes (THMs) Levels in Chlorinated Swimming Pools’ Water in Fars Province, Iran. J Health Sci Surveill Syst 2013;1(2):67-76. 4. Hang C, Zhang B, Gong T, Xian Q. Occurrence and health risk assessment of halogenated disinfection byproducts in indoor swimming pool water. Sci Total Environ 2016;543:425-31. 5. Lee KJ, Kim BH, Hong JE, Pyo HS, Park S-J. A study on the distribution of chlorination by-products (CBPs) in treated water in Korea. Water Res 2001;35(12):2861-72. 6. Lourencetti C, Grimalt JO, Marco E, Fernandez P, Font-Ribera L, Villanueva CM, et al. Trihalomethanes in chlorine and bromine disinfected swimming pools: Air-water distributions and human exposure. Environ Int 2012;45:59-67. 7. Righi E, Fantuzzi G, Predieri G, Aggazzotti G. Bromate, chlorite, chlorate, haloacetic acids, and trihalomethanes occurrence in indoor swimming pool waters in Italy. Microchem J 2014;113:23-9. 8. Manasfi T, De Meo M, Coulomb B, Di Giorgio C, Boudenne J-L. Identification of disinfection by-products in freshwater and seawater swimming pools and evaluation of genotoxicity. Environ Int 2016;88:94-102. 9. Bessonneau V, Derbez M, Clement M, Thomas O. Determinants of chlorination by-products in indoor swimming pools. 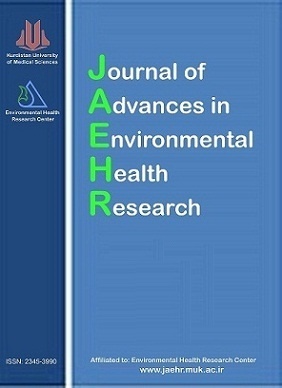 International journal of hygiene and environmental health. Int J Hyg Environ Health 2011;215(1):76-85. 11. Prochazka E, Escher BI, Plewa MJ, Leusch FD. In vitro cytotoxicity and adaptive stress responses to selected haloacetic acid and halobenzoquinone water disinfection byproducts. Chem Res Toxicol 2015;28(10):2059-68. 13. Lee J, Jun M-J, Lee M-H, Lee M-H, Eom S-W, Zoh K-D. Production of various disinfection byproducts in indoor swimming pool waters treated with different disinfection methods. Int J Hyg Environ Health 2010;213(6):465-74. 14. Kanan A, Karanfil T. Formation of disinfection by-products in indoor swimming pool water: the contribution from filling water natural organic matter and swimmer body fluids. Water Res 2011;45(2):926-32. 15. Villanueva CM, Cantor KP, Grimalt JO, Malats N, Silverman D, Tardon A, et al. Bladder cancer and exposure to water disinfection by-products through ingestion, bathing, showering, and swimming in pools. Am J Epidemiol 2006;165(2):148-56. 16. Health Canada, Guildlines for Canadian Drinking Water Quality; Guildline Technical Document Haloacetic Acids, Water, Air and Climate Change Bureau, Healthy Environments and Consumer Safety Branch, Health Canada 2008. 17. George MH, Olson GR, Doerfler D, Moore T, Kilburn S, De Angelo AB. Carcinogenicity of bromodichloromethane administered in drinking water to male F344/N rats and B6C3F1 mice. Int J Toxicol 2002;21(3):219-30. 18. United State Environmental Protection Agency (USEPA). National primary drinking water regulations: disinfectants and disinfection by products. Final Rule 1998;63(241):69390-476. 19. Standard Institution and Iranian Industrial Research. Physical and chemical specification of drinking water. 5th Revision. Tehran: ISIRI. 2009. 20. Hsu H, Chen M, Lin C, Chou W, Chen J. Chloroform in indoor swimming-pool air: monitoring and modeling coupled with the effects of environmental conditions and occupant activities. Water Res 2009;43(15):3693-704. 21. Weisel CP, Shepard TA. Chloroform exposure and the body burden associated with swimming in chlorinated pools. Water Cont Health (Wang RGM, ed) New York: Marcel Dekker. 1994:135-47. Available at: https://books.google.com/books?hl=en&lr=&id=xCruHfytXZYC&oi=fnd&pg=PA135&dq=Chloroform+exposure+and+the+body+burden+associated+with+swimming+in+chlorinated+pools.+Water+Cont+Health&ots=wfmBc- hm5v&sig=W5l9_6mDhMgNsfrvmcVZX_peKxI#v=onepage&q=Chloroform%20exposure%20and%20the%20body%20burden%20associated%20with%20swimming%20in%20chlorinated%20pools.%20Water%20Cont%20Health&f=false. 22. US EPA Method 524.2, Measurement of purgeable organic compounds in water by capillary column Gas Chromatography/Mass Spectrometry. National nexpouser research laboratory office of research and development. 1995. 23. US EPA Method 552.2, Determination of haloacetic acids and dalapon in drinking water by liquid-liquid extraction, derivatization and Gas Chromatography with electron capture detection. National nexpouser research laboratory office of research and development. 1995. 24. US EPA Method 551.1, Determination of chlorination disinfection byproducts, chlorinated solvents, and halogenated pesticides/herbicides in drinking water by liquid-liquid extraction and Gas Chromatography with electron capture detection. National nexpouser research laboratory office of research and development. 1995. 25. Kim H, Shim J, Lee S. Formation of disinfection by-products in chlorinated swimming pool water. Chemosphere 2002;46(1):123-30. 26. Thacker N, Nitnaware V. Factors influencing formation of trihalomethanes in swimming pool water. Bull Environ Contam Toxicol 2003;71(3):0633-40. 27. Yang L, Schmalz C, Zhou J, Zwiener C, Chang VW-C, Ge L, et al. An insight of disinfection by-product (DBP) formation by alternative disinfectants for swimming pool disinfection under tropical conditions. Water Res 2016;101:535-46. 28. Weaver WA, Li J, Wen Y, Johnston J, Blatchley MR, Blatchley ER. Volatile disinfection by-product analysis from chlorinated indoor swimming pools. Water Res 2009;43(13):3308-18.